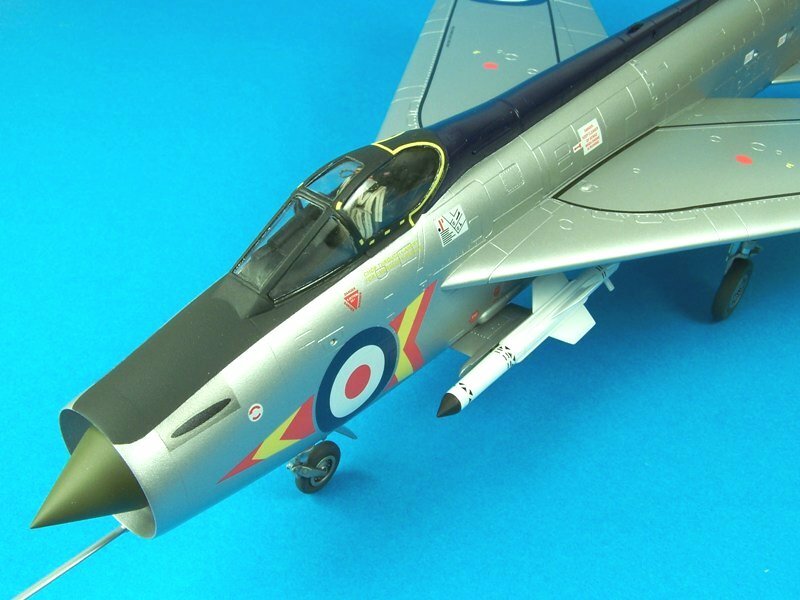 The BAC Lightning was Britain's first and last supersonic interceptor. This Mach 2 jet was in service for nearly 30 years with its retirement in 1988. The Lightning's clean lines and unique over and under engine arrangement make it a must have for any modern jet collection. 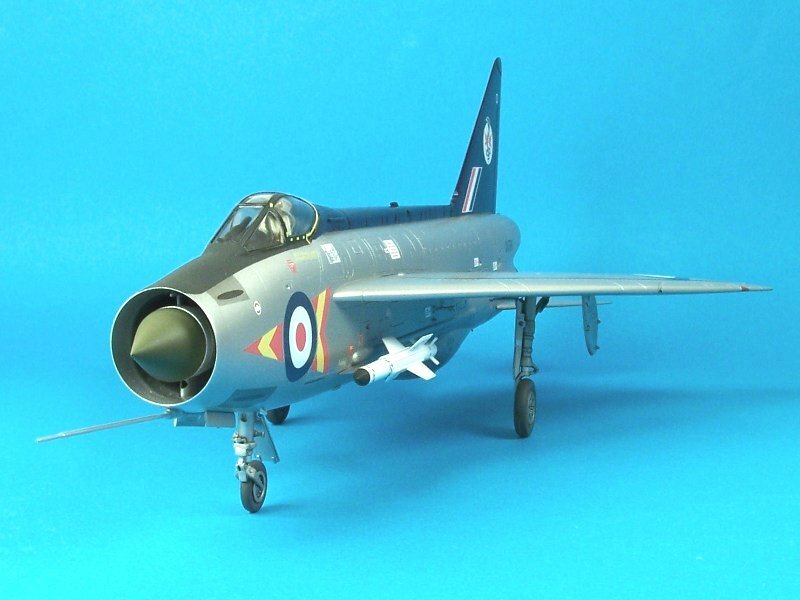 Eduard's new kit of the Lightning is from their Limited Edition series and contains essentially EVERYTHING the modeler needs to build a stunning replica right from the box. 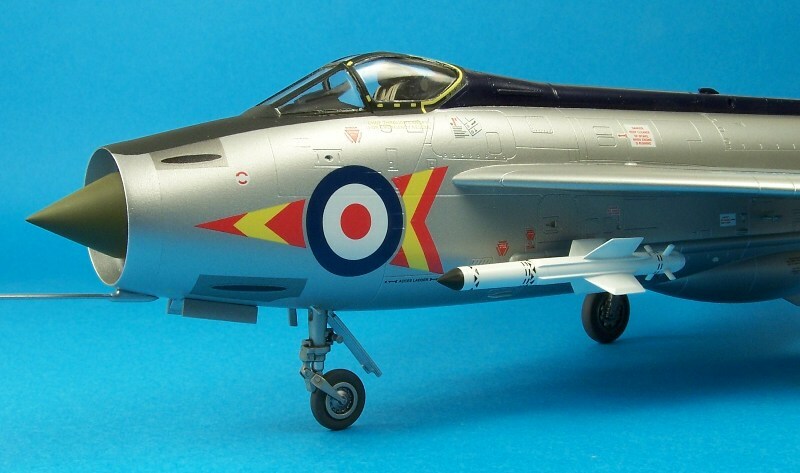 All that the would-be 1/48 Lightning builder needs to add is paint, glue, and time. Striking box art adorns the sturdy and rather tight opening box, an Eduard hallmark. Cracking the lid open reveals (8) sprue trees, (1) large decal sheet, (2) photo etch frets, (1) canopy Mask, and a nice resin seat from their new Brassin line. A multi lingual instruction sheet and a fold out full color painting guide are provided, offering the modeler a choice of (4) paint schemes. The construction phase started like many other aircraft builds....in the cockpit. This was my first taste of Eduard's new Brassin line of resin parts, and the supplied resin seat was superb. Once the seat is assembled and painted the kit provides the modeler with pre-painted seat belts and placards. The pre-painted etched parts overlay the plastic cockpit parts and fit reasonably well. The modeler will need to use caution and dry fit everything before committing to glue. If you rush the cockpit without dry fitting, the fuselage will not close up. Thinking a few steps ahead to the painting stage I had to figure a way to be able to hold the model while painting. The instructions would have you insert the afterburner pipes early on, and I wasn't sure how securely I could hold the kit by inserting a wood dowel into the assembled plastic tail pipes. Actually I was sure of one thing, inserting a rod to hold it would have cracked or ruined the finish inside the pipes. A solution revealed itself on the afterburner bulkhead, part number 20. I realized the support that part gave to the structure of the model was minimal so I left it out, thus allowing me to skewer the jet on a sturdy wood dowel for painting. The bulkhead (with attached afterburner) was then sanded to a figure 8 shape so it could be inserted at the end when painting was complete. After detail painting was done in the cockpit and to the seat, the fuselage went together without too much fuss (you will certainly need nose weight, so don't forget to add that before closing things up). The nose area contains options for gun panels and these are provided as inserts. I can't stress enough on dry fitting this area; I rushed a little and got bit. The gun troughs are very shallow and excess sanding will completely obliterate them as I found out; more about that later. Wings offered up to the model fit nicely with minimal seams on the top and very slight, easily filled ones on the bottom. Etched parts are called out here and there on the instructions and are quite extensive. Landing gear and gear bays have several PE parts and all will build out nicely, if a bit fussy to mess with. Even PE brake lines are included if you so desire to detail these areas. I left them out, the detail is fine, but they look a little one dimensional for me. In preparation of paint I sealed up the cockpit for a closed canopy look. 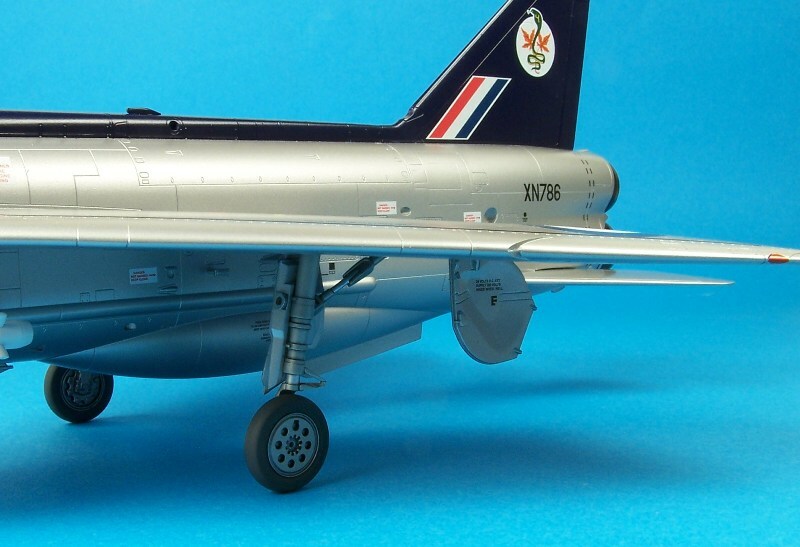 The sleek lines of the lightning are complimented with the canopy closed in my opinion. Be warned though, very little of all of the color PE will be visible through the thickish canopy. The jet was given a last once over to check for errant seams. Once things were looking good, I masked the canopy with the supplied masks and painting commenced! Three of the schemes listed on the painting guide are in natural metal, with one machine in an overall dark green livery. I wanted a crack at a producing natural metal finish so I choose version C, a Lightning based out of Gutersloh in the 60's. It had a natural metal fuselage with a striking blue cap and tail. I sprayed Tamiya TS-11 gloss aluminum right from the can to form the basis of my natural metal scheme; thinned X-3 Royal Blue was shot through my airbrush for the blue painted areas. A final coat of Nato Black formed the anti-glare panel and cockpit framing. Alclad II dark aluminum was used on the forward gun panels and white aluminum was used to simulate the polished nose and after burner rings visible on actual Lightning jets. As seen in the pictures, I wasn't too successful with this, as the Alcad II white aluminum was an almost exact match for the Tamiya TS base coat! Detail painting of the Landing gear and Fire Streak missiles was completed then it was decal time. After an overcoat a Testor's Metalizer sealer the jet was ready for decaling. A few evenings were spent decaling as the sheet is large and extensive. The Cartograf printed images went on with hardly any setting solution and performed superbly. There is one error on the sheet; the black wing walk lines are too wide. It's not the width of the actual stripe, but the width of the overall image on the wing. The modeler is advised to start the wing walk stripes ahead of the first panel line on the wings. If you start behind the line, the wing walk line misses the rear panel line and sits too far back on the wing. Or you could just paint them on! If you will recall my blurb above about my rush job on the nose, here is how the story ends. I had indeed completely obliterated the gun troughs in an effort to have a clean join line at the nose. Well I had the smooth nose seam, but no gun troughs, so after some thought I decided to just print some oval decals on my printer and be done with it. They don't look bad and from a short distance they really look like the open gun ports. Lesson learned: don't rush! Model Master Semi-gloss provided the sheen I was after and was applied by airbrush. The final items, gear, missiles, etc. were added and the Lighting was done. My overall impression of the complete package was favorable and I view it as worth the money. If you add up all of the extras Eduard has included to a bare bones lighting kit, it would be more than the price of this product. I do like this style of packaging and I hope to see more of it like we do in the AFV model industry. I would recommend this kit to modelers with moderate experience only because of the photo etch parts. My thanks to Eduard for the review sample, keep this style of kit coming!